Big Dave, larger than life.. at 6' 4'' too tall even for David Bailey to get him all in the photo, a legend in his own lifetime...Born in the age of Austin Powers this International man of mystery is a regular attender at both Selby and Haxby Clubs. 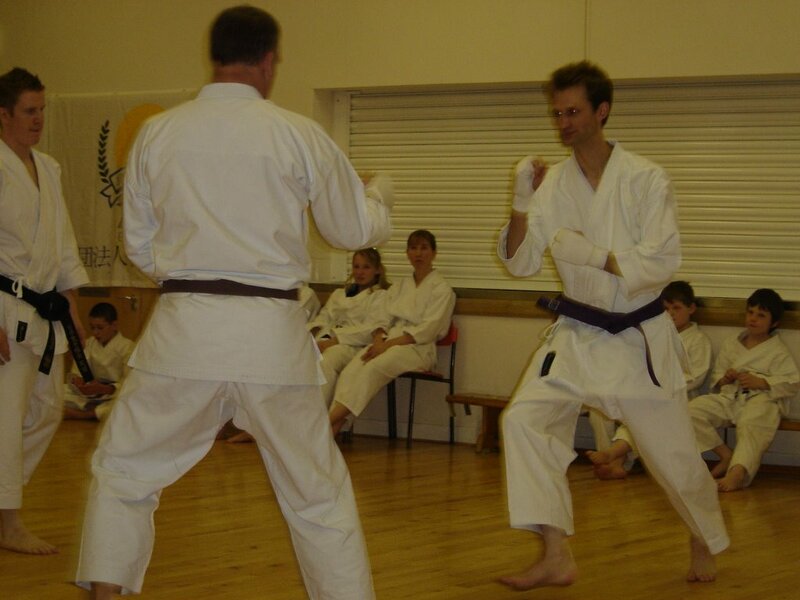 Dave was graded to 3rd Kyu by Kato Shihan in October 2005. Dave should be very proud of what he has achieved, but shall we see from wence he came? 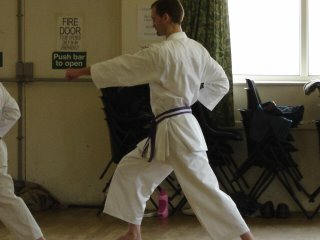 Dave's first grading was in March 02, he attained 8th Kyu in July 03 and 7th Kyu in October of the same year. Here in July 04 we see Dave grading for his Green Belt, under the ever critical eye of Gullen Shihan Dave goes through the Kihon (basics) section of his grading. 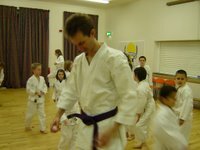 In Nov 04 Dave grades for his purple belt 5th Kyu, this is a big step up from the lower grades and expected standards are demanding. 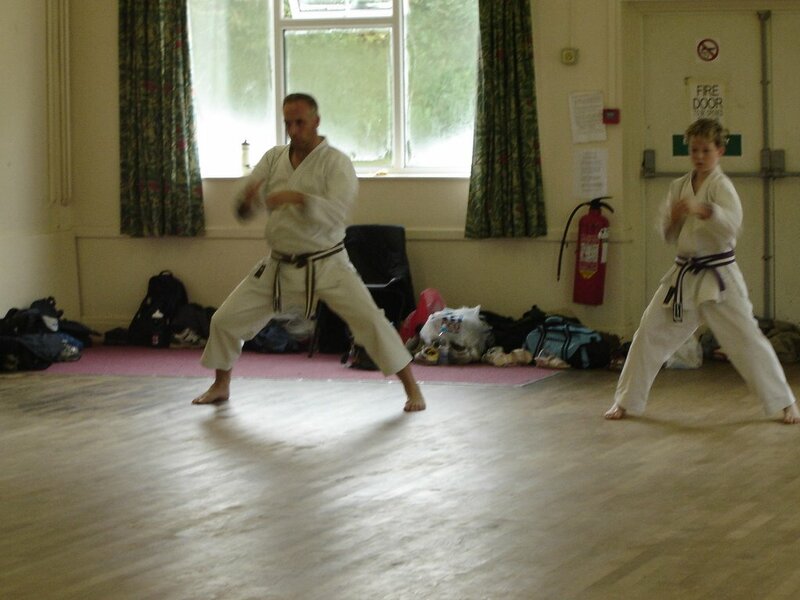 Above Dave performs Sanbon Kumite (3 step sparring) with Dave from Haxby. In December 04 we started a tradition of holding a low profile display. 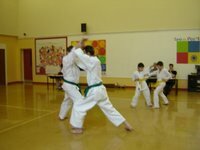 Junior karateka could show parents and family what they had learnt during the past year. Following displays of knee boxing, 5, 3, and 1 step kumite by club members sensei Ash ask Dave and myself to do a little "relaxed" ippon kumite. Above Dave is ready for action, did the punch score or go past? Opps! Sorry Dave... and things were going so well. 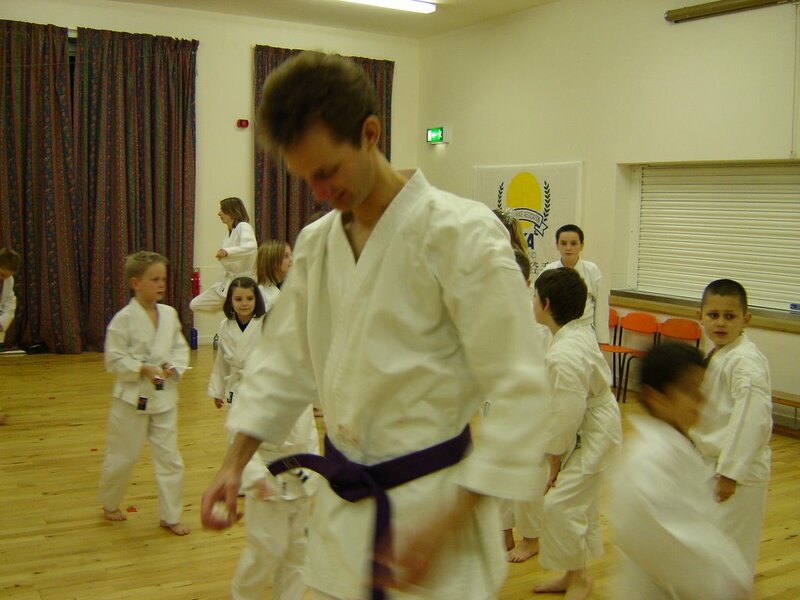 In March 05 Dave goes on to Grade for his 4th Kyu a transission to Brown belt, the Purple and white belt is yet another giant leap for both Dave and mankind. Sensei Keith Krieghton is a very welcome presence on the Kihon table. Sensei Ian Shaw is still dreaming up increasingly difficult combinations. 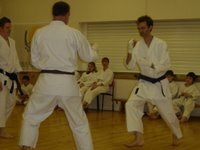 Left: Dave performs Tekki Shodan. This is a difficult Kata for all of us over six feet tall. Why does Kata always look better when the shorter Karateka perform it? October 2005 Dave is a Brown belt! Dave is a keen motorcylist and has a strong interest in all Japanese. Dave we have seen you progress in the last few years, your hard work and regular training at both Selby and Haxby has provided the foundation for seven successful gradings in a row. No Training for two weeks! What are we going to do? Look forward to next year and train hard. Club ambitions - What is your goal for 2006? Aim high and work hard, the more you put in the more you will get out. I tend to get Karate withdrawal syndrome if I don't train, so before I went on my 20th anniversary holiday with Claire my wife I checked out if there were any local clubs. Hawaii is known for its hospitality. Sensei Kim picked me up from my hotel and told me a lot about their club as we drove the fourty odd minutes to the dojo. The dojo was at a local school, training outside but under cover. Sensei Edward established his current club in close association with the local church after a few years rest from karate following poor health. I think Kim was a little concerned that I may find the club a little too informal, the lesson starting with a prayer etc. The club did work to Hawaii timings and students arrived throughout the class. I was trying to collect my thoughts about what I could say about my visit to Fujiwara sensei's dojo. 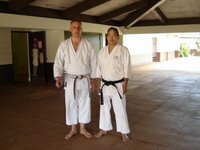 I come from a church background myself, my father being a retired C of E priest ( not that priests retire really) Fujiwara Sensei (5th Dan) become the chief instructor of the JKA / Hawaii, appointed by his good friend Asai Sensei. 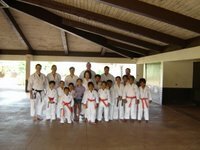 Since turning to Christ at New Hope Mililani, Hawaii Sensei now wants his knowledge to glorify Christ. 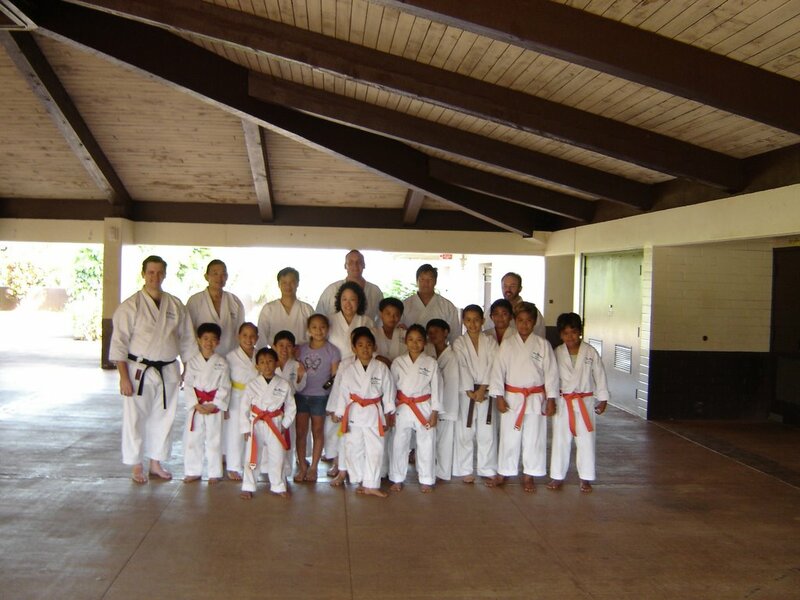 In Sensei's words " Jesus Christ : Chief Instructor - Ed Fujiwara : Instructor" Sensei has worked closely with senior pastor Mike Palompo to run a club for the community, that is designed to be fun, safe and uphold high Christian values. 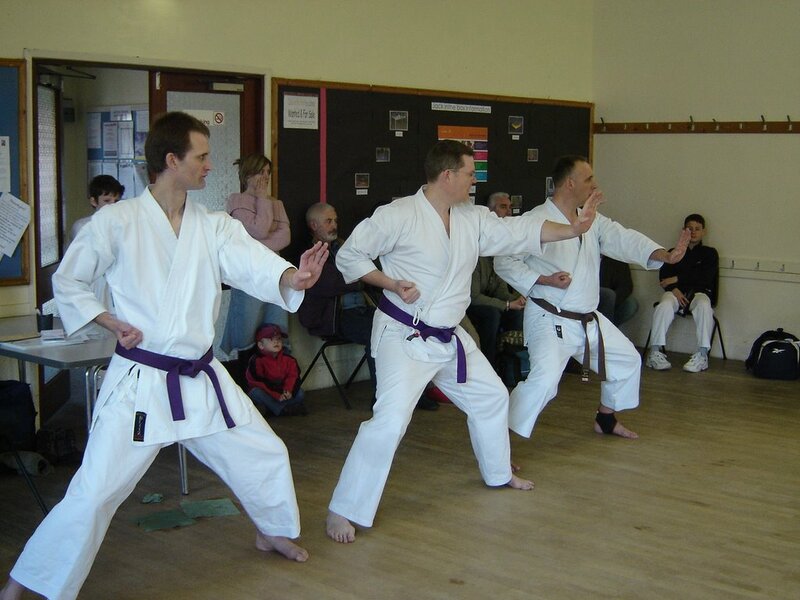 New Hope also have very high traditional Shotokan standards! Sensei means teacher as most people know, but I read somewhere where one of the karate masters addressed an elderly Japanese man as "Sensei". His student asked what grade he was and from which association, only to be told that he had never been involved with karate. 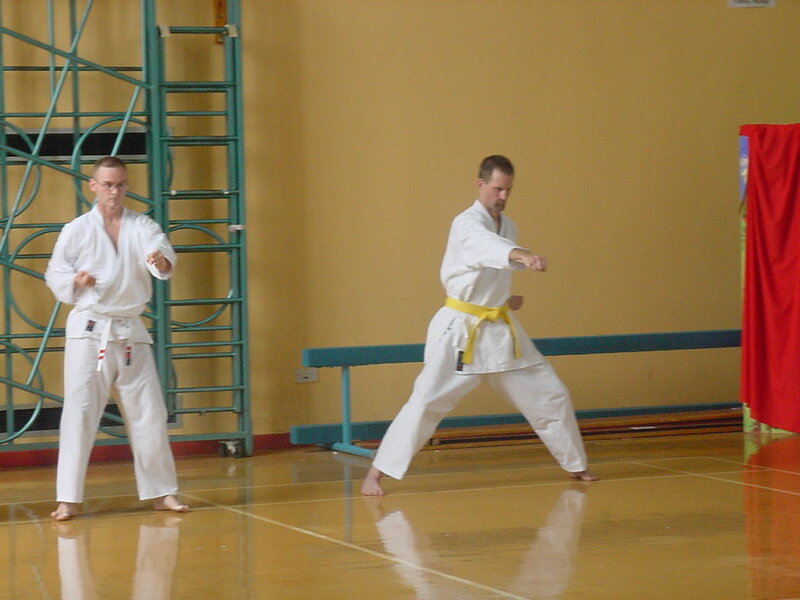 The term Sensei had been used because of the respect that the gentleman was held in by the Shihan. It appeared to me that Sensei Edward had more to teach than Karate, he has a vast depth of karate knowledge that is evident in his teaching, but more than anything humility. I could not have been made more welcome if I had been Asai sensei himself. I like to think as Karateka we are one family. 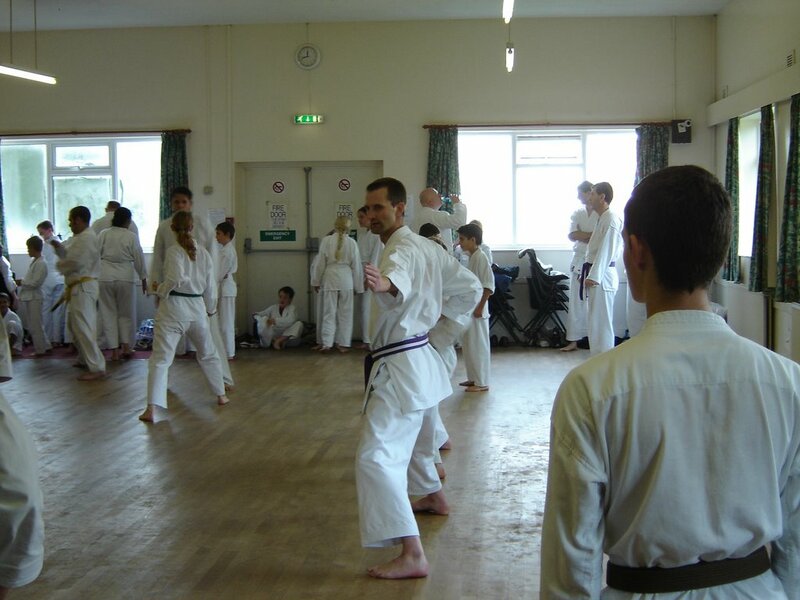 I was talking to Sensei Keith Gullen from York last week and I said that it was difficult to put my finger on what I gain from training with our extended karate family, from Sensei Edward it has been inspiration in both my karate and in my faith. After training Sensei took me to lunch and gave me a club badge which I will wear on the base of my Gi jacket with pride. 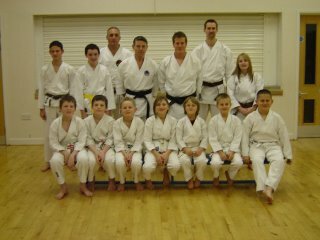 On Saturday and Sunday the 29th and 30th October 2005 I went down to train in Nottingham with Sensei Alan Campbell JKS (GB) Chairman and Sensei Koike JKS (Switerland). 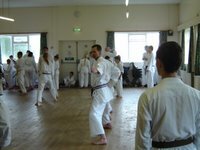 As I am (slowly) working towards my dan grading and I try and attend any local courses I can. At the IJKA we have strong links with the JKS under the direction of Asai Shihan. Sensei Campbell is a former National Kata and Kumite Champion and Sensei Koike is I believe the only sensei that has completed both the JKA and JKS instructor courses at the relevant Hombu dojos. Sensei Koike instructed Hangetsu and absoption training. 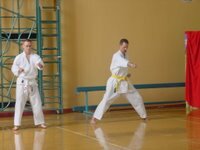 Sensei managed to link the two lessons and didn't disappoint with his bunkai. Sensei Koike is renowned for his bunkai. Sensei Campbell taught resistance training, your Kihon had to be good because any fault in your technique is amplified by the resistance of the rubber tube. It proved to be one of the most tiring things I have tried. Sensei - Thank you for your hospitality - Osu!